Scott and I are excited to announce that TBD (The Baby Davis) is on his way. 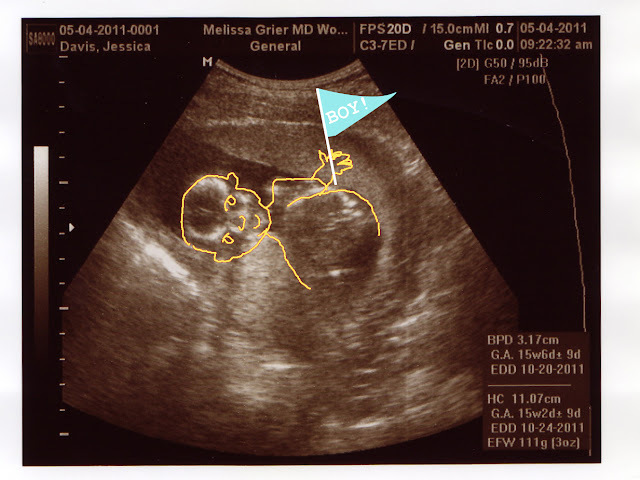 We found out on Wednesday that we are having a boy. He is due on Oct 28! Various naming conversations have ensued, not with much success. Thus far we have only come up with a whole bunch of offensive acronyms and ridiculous eponyms. Commander Davis, Davis Davis, Flava Davis anyone? As we spend the next six months trying to think of more innocuous agreeable names to call our child, I plan to continue blogging, maybe throwing in a tidbit here and there about fun baby and nursery items. The Eagle's Nest will by no means be turning into a baby blog (I'll point you to those if you're interested) but we are excited to be feathering out nest and adding one more inhabitant to our little flock. ***Photo above is my attempt at showing my family what they were seeing other than a grey blob. TBD was laying on his side looking at the camera. Congratulations, Jessica. What an exciting news. Wishing you a beautiful pregnancy! Congratulation Jessica and a very very happy mother's day to a new mommy! motherhood.. the most amazing thing that will happen to you trust me.